Note from shop owner My shop is temporarily closed at this time. I am currently moving and making changes and I'm hoping to reopen as quickly as possible once the dust settles! See you soon! My shop is temporarily closed at this time. I am currently moving and making changes and I'm hoping to reopen as quickly as possible once the dust settles! See you soon! Love my new hat! It's well made and keeps my noggin warm! Thank you! A close up of the beautiful tweedy green yarn of this green scarf. 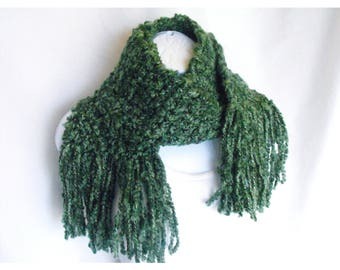 This scarf is one of a kind so get it now with FREE shipping before it's gone! Beginning of another red scarf. This red is one of my favorites, how about you? I learned to knit and crochet as a young child at the knee of my great-grandmother. My mother Robin's passion for crochet inspired my creativity and I am thrilled to dedicate my collection to her memory. From my first craft show in high school I wanted to share my creations with everyone. Today I am sharing them with you here on Etsy! From my home to yours, each item is handmade by me with love and care. Born and raised in the Detroit area, I now live in the beautiful Amish country of Northern Indiana with my husband, son, two dogs and six pampered hens. When I'm not crafting or spending time with my family, you can find me out in the vegetable garden or trying out new recipes in the kitchen. I hope you enjoy my handmade creations as much as I enjoy passing on traditional and timeless crafts. Thanks for visiting my shop! Stay-At-Home Mom armed with crochet hooks and knitting needles...and uses them!! Creating the very best warm and thoughtful gift ideas for you and your loved ones. 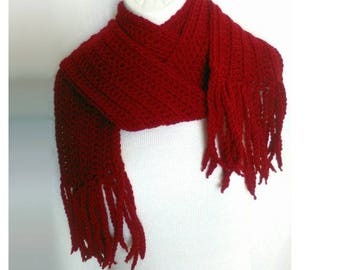 Shawls, scarves, jewelry and more. 🌼 Thanks for stopping by! 1. The information that you manually provide by emailing me for more information, signing up for my email list for discounts, or making a purchase. This information can be tied directly to you because of the type of information you’ve provided and will only be used to provide the information, products, or services you requested. You may also choose to provide me with additional personal information as necessary (such as size information, for example), that would help me better serve you. I do my best to protect your sensitive personal information. I do this by partnering with Etsy, WordPress.com, Mailchimp, Google Inbox (Gmail), and service companies such as USPS, UPS and FEDEX to process the information you provide. This information is shared with them so that I can better serve you as my customer, and create a better shopping experience and products that you love. The information collected is only shared with our trusted third party partners when necessary to deliver the information, services or products that you request. Most information is retained only for as long as necessary to provide you with the services requested. Some information, however, I may be legally required to retain for up to seven years.